Let’s connect some Lenten dots by way of scriptural reflection and trace a sinister sequence of attempts to kill the Son of God, the Word of God – a connecting of black dots, each meant to end the sentence of the Word’s life on earth! Some spontaneous, others devilishly devised. First, and probably the most vicious of all – the crucifixion excepted – is Herod’s concerted effort to destroy the tiny newborn baby Jesus! We are all familiar with the story. The angel of the Lord warned Joseph: “…flee to Egypt …for Herod is about to search for the child to destroy Him” (Mt 2:13). Herod’s plans reach a rancid fruition just after Joseph flees by night with Mary and the newborn Jesus. Herod is “in a furious rage” and ordered the killing of “all the male children in Bethlehem and in all that region who were two years old or under” (Mt 2:16). 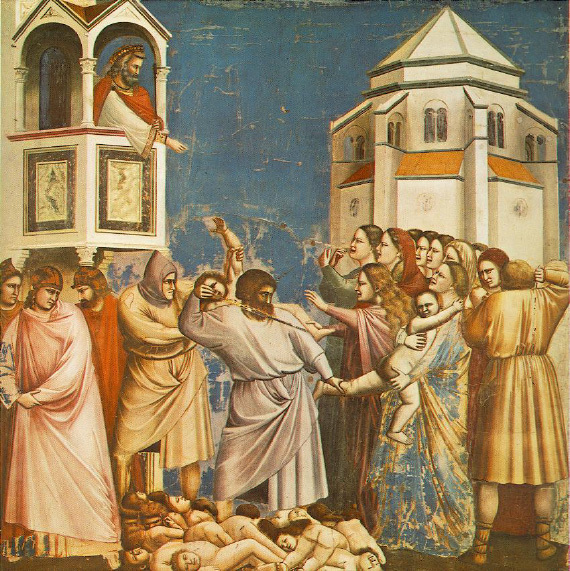 These were the “Holy Innocents” killed in the very place of Jesus, because Herod suspected that each one of them might be the newborn King of the Jews. Each of these babies is an innocent martyr – a baby alter Christi. And there was mourning, the first attempt upon His life. We know now that Herod helped inspire the paranoid “Planned Parenthood” mentality so common today, and that if he had had the opportunity to have Unborn Jesus aborted he would have done so instantly! Unborn Jesus, like any “unwanted” unborn baby, represents a threat to the status quo. We now fast forward about thirty years to the outset of our Lord’s public ministry. After Jesus was baptized by John, the Holy Spirit led Him out into the wilderness where He fasted for forty days. At the end of this period, the devil came to Him and tempted Jesus three times. The third deceitful temptation was a direct attempt upon the life of Jesus by the devil. They were on the pinnacle of the Temple in Jerusalem and the devil challenged Jesus: “If you are the Son of God, throw yourself down from here…” (Lk 4:9-12). Christ does not succumb and the devil leaves Him, but Luke observes “he departed from Him until an opportune time”. The second attempt upon His life. A little later Jesus returned to His hometown of Nazareth and went to the synagogue on the sabbath. He read a messianic prophesy from Isaiah and then explained that the text was being fulfilled in their midst. As he continued to speak the crowd became disenchanted: “…all in the synagogue were filled with wrath. And they rose up and put Him out of the city, and led Him to the brow of the hill on which their city was built, that they might throw Him down headlong. But passing threw the midst of them He went away” (Lk 4:28-30). The third attempt upon His life. One day, during the third year of His public ministry, Jesus was in the Temple in Jerusalem teaching, when things grew controversial. Surprisingly, He got into a debate with “the Jews who had believed in Him” (Jn 8:31). Finally, Jesus says to them: “Truly, truly, I say to you, before Abraham was, I am.” What did the Jews “who had believed in Him” do (along with others who didn’t believe in Him)? “So they took up stones to throw at Him; but Jesus hid himself, and went out of the temple” (Jn 8:57-59). The fourth attempt upon His life. Finally, it was wintertime, the feast of the Dedication and Jesus was in the Temple in Jerusalem at a spot called the portico of Solomon (Jn 10:22-23). He is challenged by the people and He gives a short answer, ending with: “I and the Father are one”. We read: “The Jews took up stones again to stone Him” (Jn 10:31, also 11:7-8), He speaks again, then they try to arrest Him but He “escaped from their hands” (10:39). The fifth attempt upon His life. 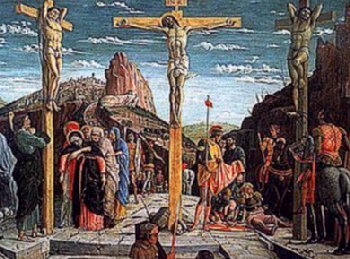 We are all familiar with the sixth and final attempt upon our Lord’s life; His bloody Passion and crucifixion atop Golgotha! Jesus was targeted from infancy through adulthood. From the devil to His own countrymen, from political leaders to religious leaders, His innocence and authoritative teaching was difficult for sinners to bear. So too today, the innocence of the unborn baby and the “word” each would speak, is attacked by a self-absorbed hypocritical world that falsely champions human rights while daily plotting the deaths of the weakest among us. Thank you very much for your recent postings. Speaking of attacks on the Word, I’ve been on a “slash.dot” blog today where the heathens are raging over the Vatican’s updated social sins list. Much tooth gnashing in full force among the Richard Dawkins fans. I’m sure that whenever the Pope speaks about sin that there is much inward gnashing of teeth. Thanks for the slash.dot blog alert!